Conventional theories of capitalism are mired in a deep crisis: after centuries of debate, they are still unable to tell us what capital is. Liberals and Marxists both think of capital as an ‘economic’ entity that they count in universal units of ‘utils’ or ‘abstract labour’, respectively. But these units are totally fictitious. Nobody has ever been able to observe or measure them, and for a good reason: they don’t exist. Since liberalism and Marxism depend on these non-existing units, their theories hang in suspension. They cannot explain the process that matters most – the accumulation of capital. Written in simple language, accessible to lay readers and experts alike, the book develops a novel political economy. It takes the reader through the history, assumptions and limitations of mainstream economics and its associated theories of politics. It examines the evolution of Marxist thinking on accumulation and the state. 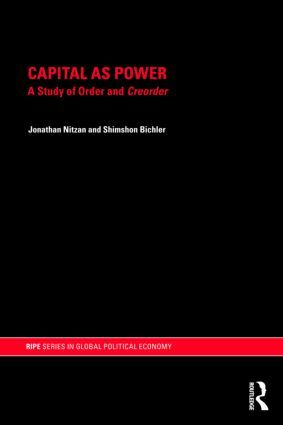 And it articulates an innovative theory of ‘capital as power’ and a new history of the ‘capitalist mode of power’. Why write a book about capital? The Marxist entanglement II: Who is productive, who is not? Capitalization: Fiction, mirror or distortion?